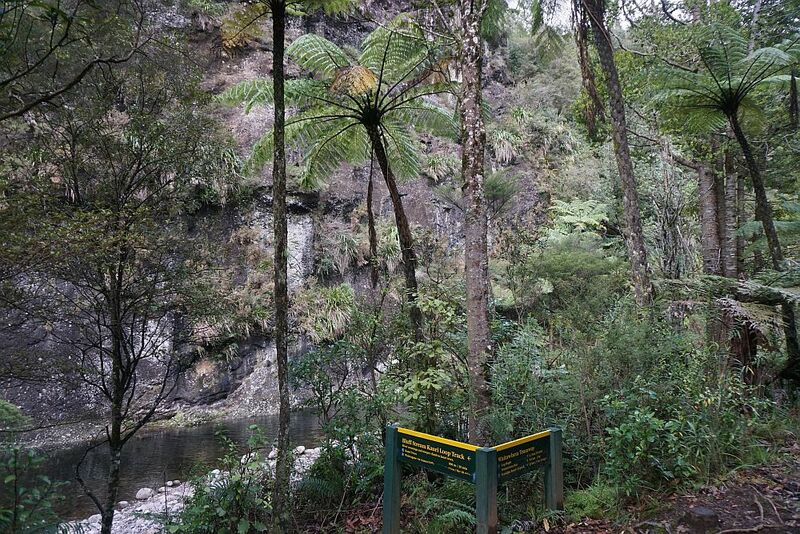 Two of the largest Kauri trees in the Kaimai-Mamaku Forest Park can be seen alongside the Bluff Stream Kauri Loop Track. 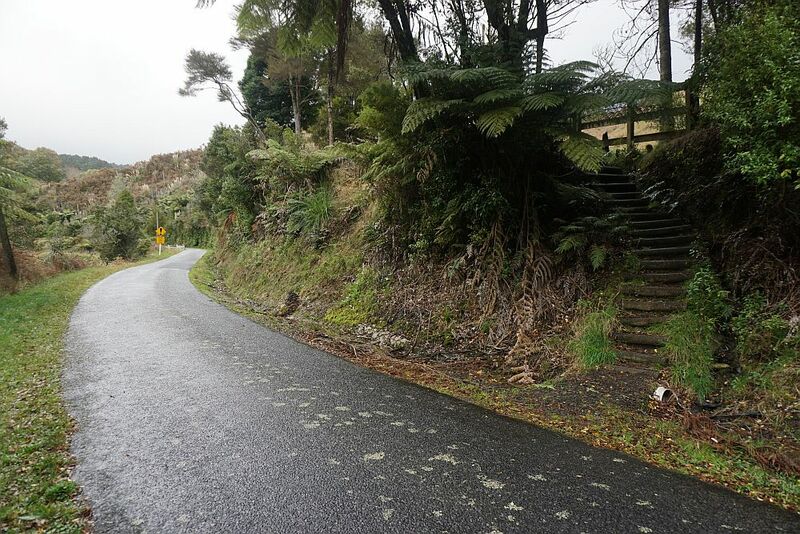 The track is accessible from the end of Franklin Rd, off Waitawheta Rd, between Waihi and Karangahake. 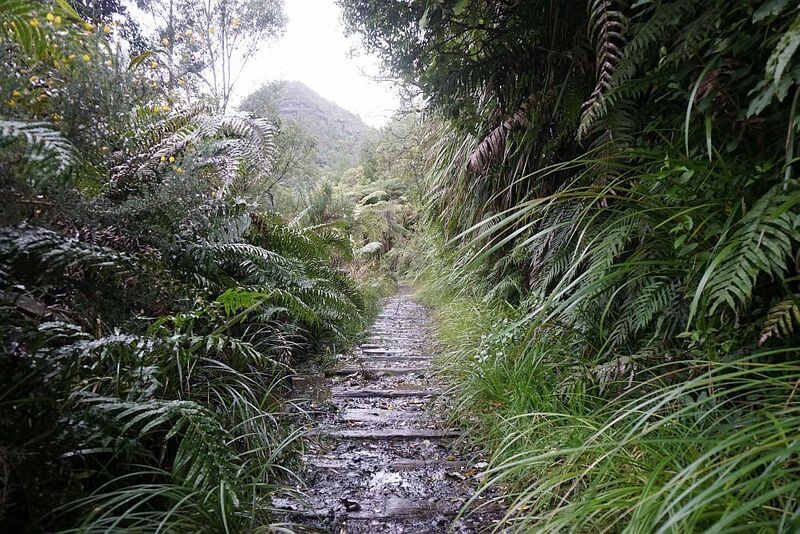 The loop track passes around Maungawhio, a 366m high dome-shaped knoll. The large Kauri trees are on the south-eastern side of Maungawhio. 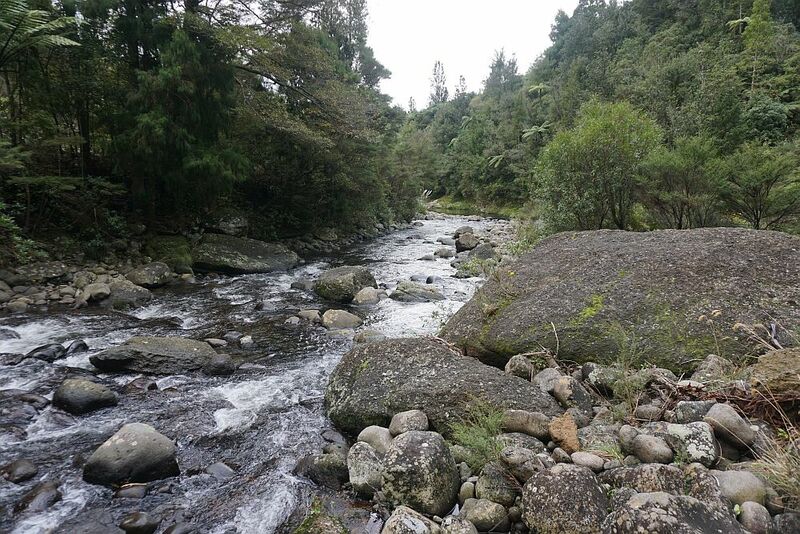 The most difficult part of the walk are the river crossings, especially during winter or after heavy rainfall. 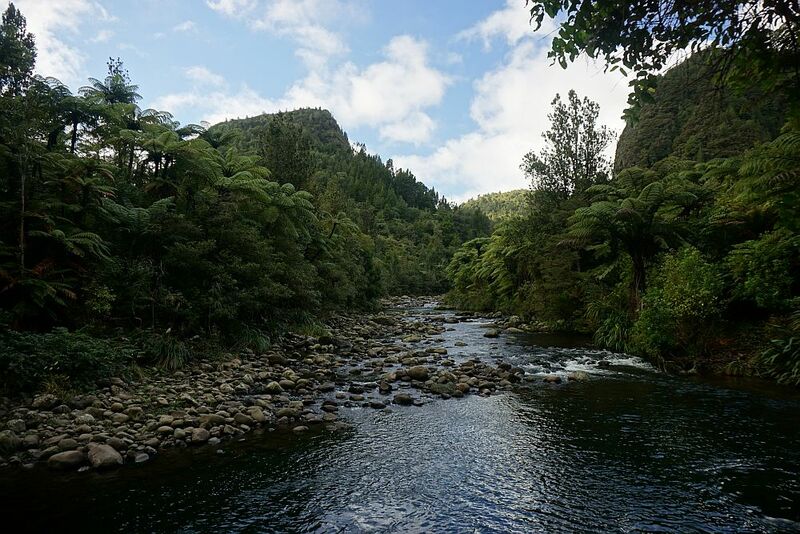 The track crosses the Waitawheta River twice, and Bluff Stream, a tributary to Waitawheta River, once. Both were about knee deep at all 3 crossing locations during this walk. 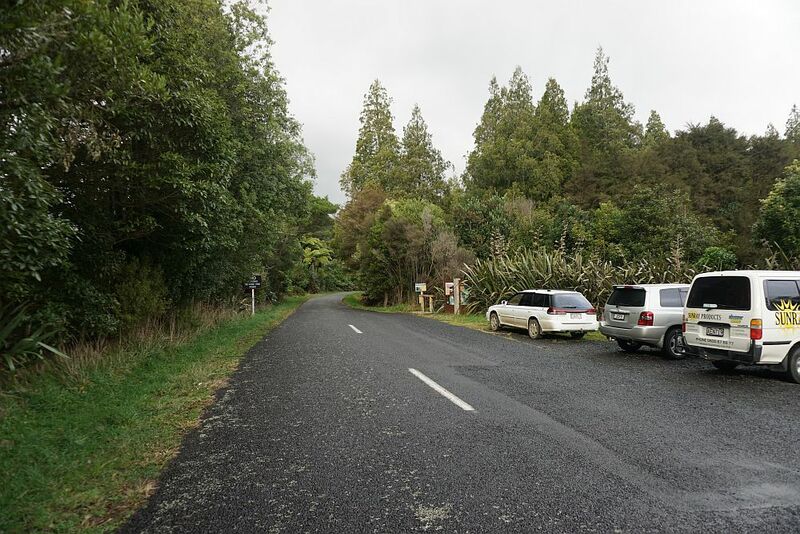 There is a small parking area alongside Franklin Rd at the start of the Waitawheta Tramway track leading to the Kaimai-Mamaku Forest Park. There are no toilet facilities at the parking area. The DoC web site claims the loop is 4.5km and takes about 3 hours, but this is only the loop portion of the track. 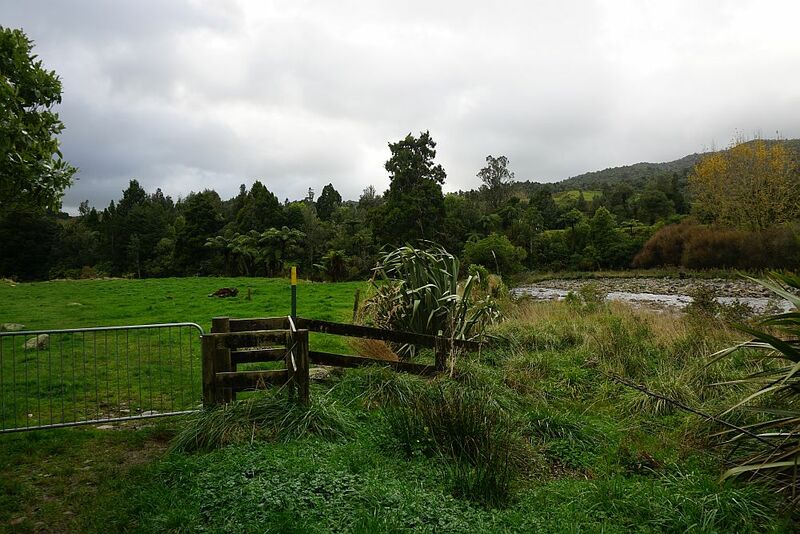 There is a 2km walk alongside the Waitawheta River, following along the old tramway through farmland, before reaching the park boundary and the actual loop. This adds about half an hour each way to the total walking time. The GPS total for the walk was about 9.5km, and the total time about 3 hours 40 minutes, including a short break by the river. The parking area at the end of Franklin Rd, and the start of the walk along the tramway. 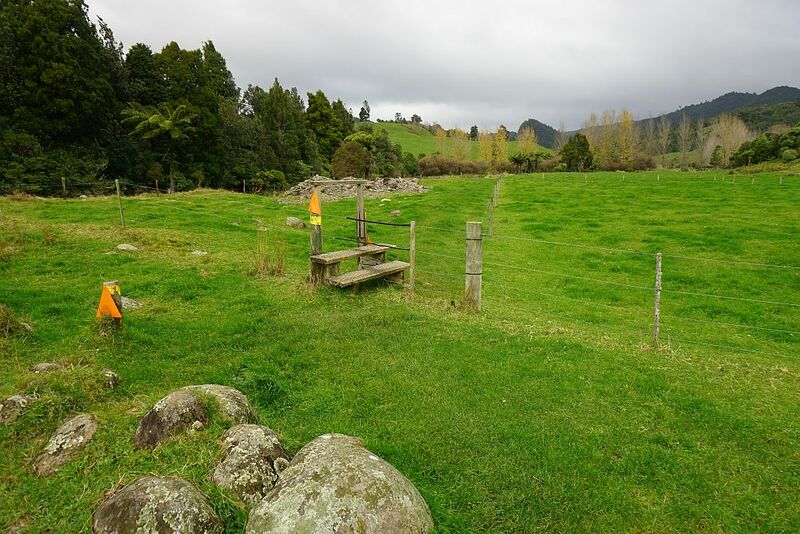 The first 2 km of the tramway track runs through farmland, alongside the Waitawheta River. There are stiles to cross and stock-proof gates to pass through. 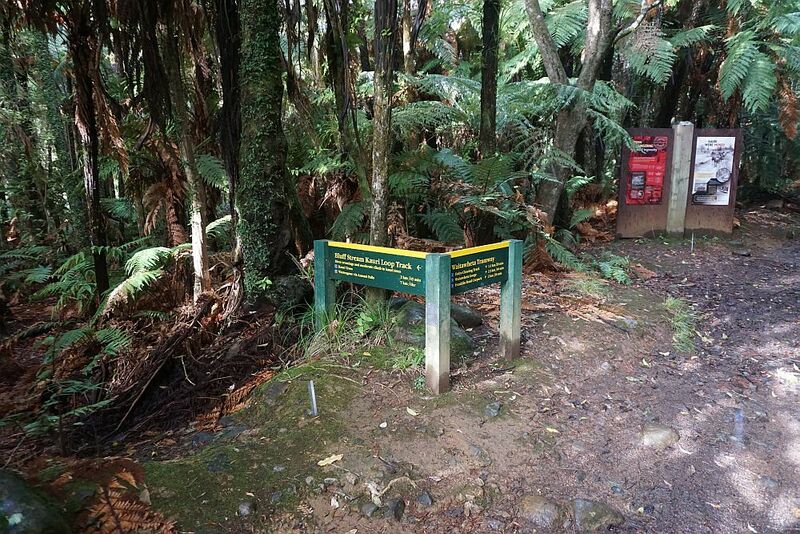 The entry point to the Kaimai-Mamaku Forest Park and the Bluff Stream Kauri Loop Track. The Bluff Stream Kauri Loop Track goes off to the left (eastward) a few metres from the park entry point. The tramway continues on to the right. 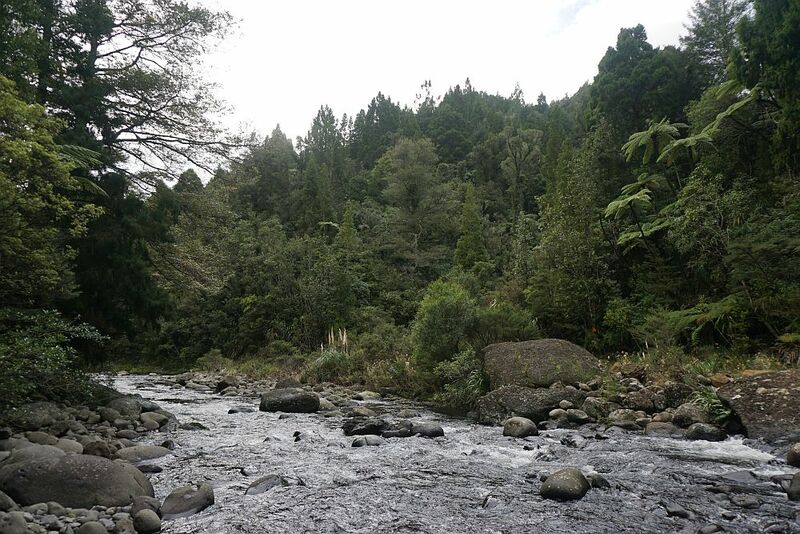 The first river crossing is only a few metres from the start of the loop track. 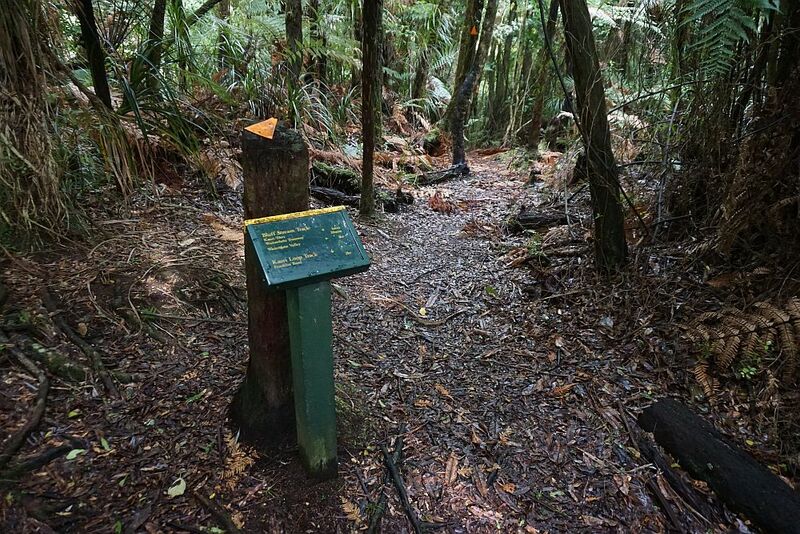 There are several examples of regenerating Kauri trees alongside the track. 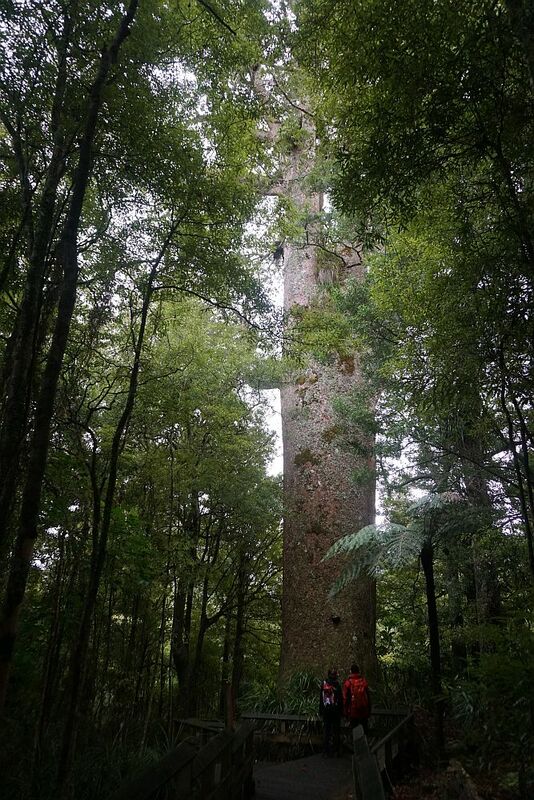 They would have been too small or too inaccessible when the whole area was logged for Kauri over 100 years ago. This one about the right size for a tree hugger. One of the smaller and easier stream crossings along the track. 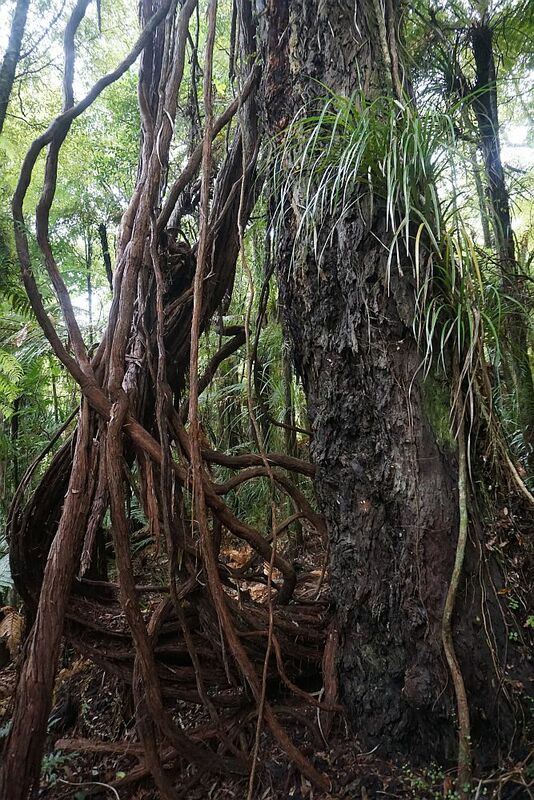 There is competition among the Rata vines on some of the larger trees. 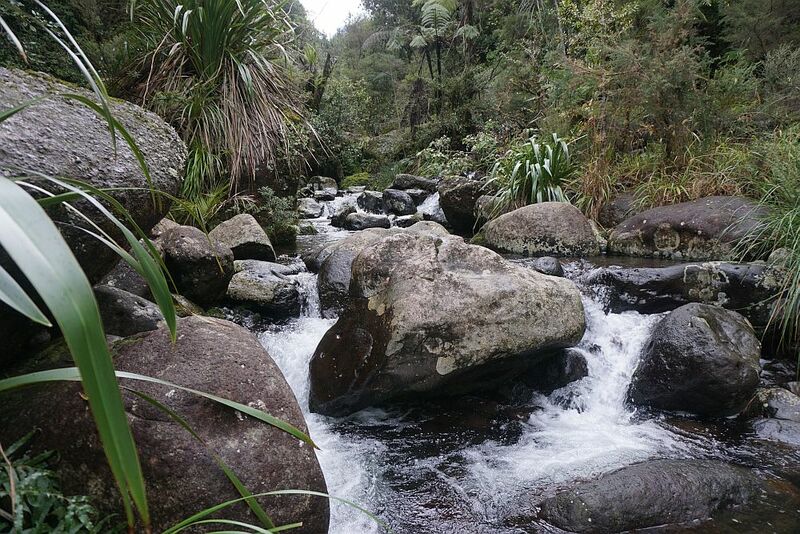 The Bluff Stream Kauri Grove Track joins up with the track leading to Waitengaue Valley and Ananui Falls. The large Kauri trees are a short distance down to the right. 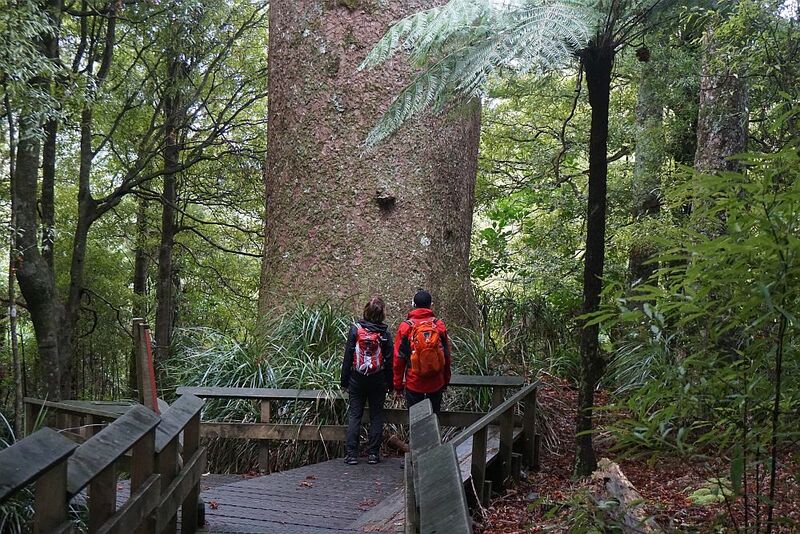 The first of the two large Kauri trees, here with two admirers on the boardwalk at the base. The boardwalk helps to protect the sensitive roots from damage. 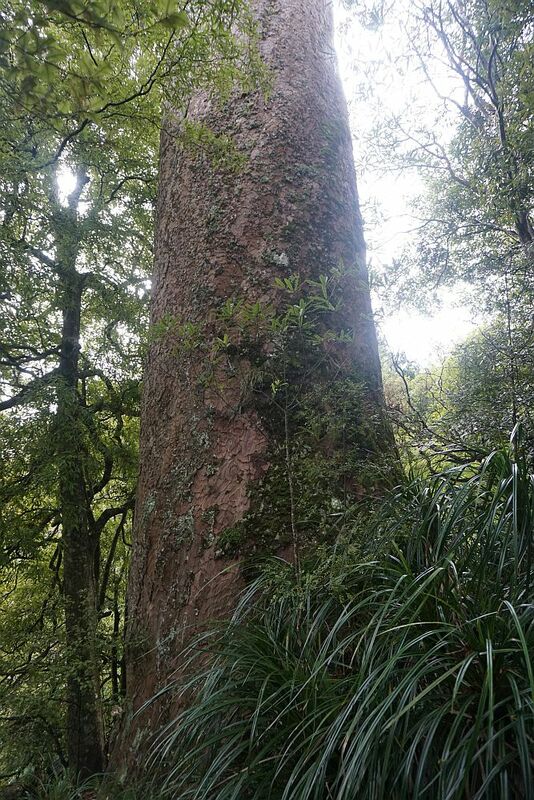 The second of the two largest Kauri trees. After a steep descent with steps there is a crossing of the Bluff Stream. 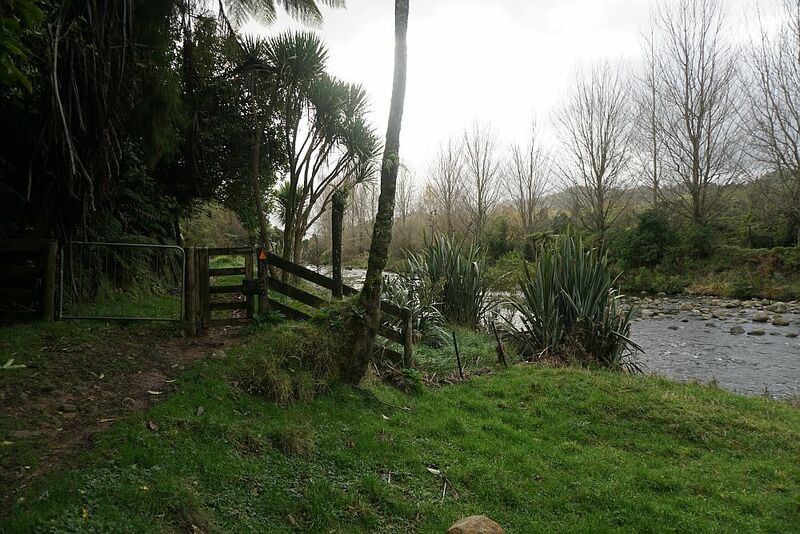 And about 100m further on there is a crossing of the Waitawheta River. Bluff Stream joins the river before it disappears from sight behind the vegetation. This was a pleasant spot for a short break, with a bite to eat, and an opportunity to empty the water from waterproof boots. 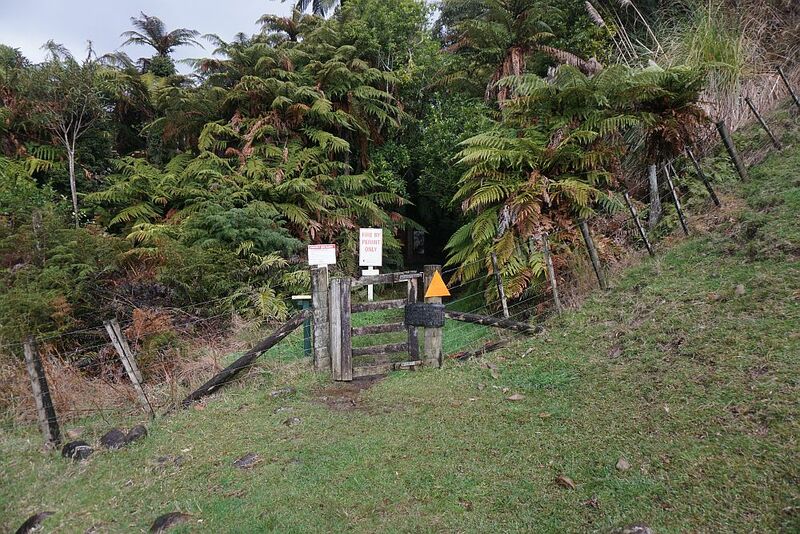 The Bluff Stream Kauri Loop Track ends nearby, joining up with the Waitawheta Tramway Track. 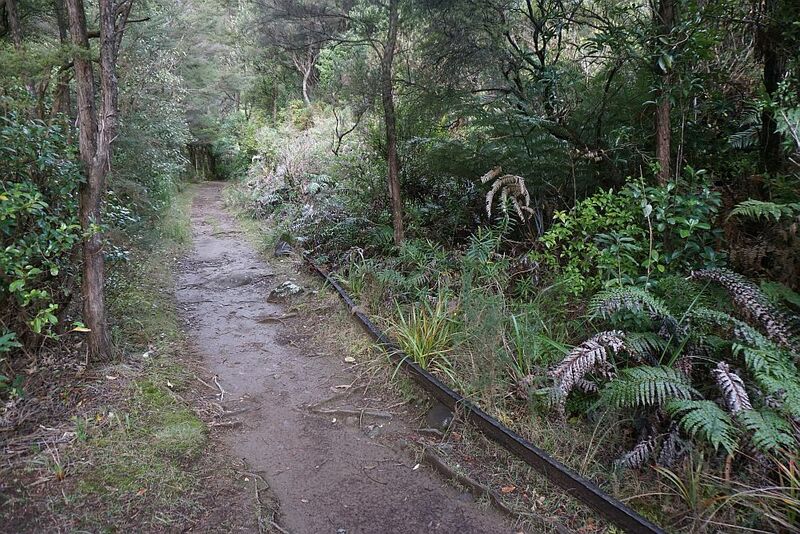 The tramway follows the Waitawheta River back to the entry to the forest park. 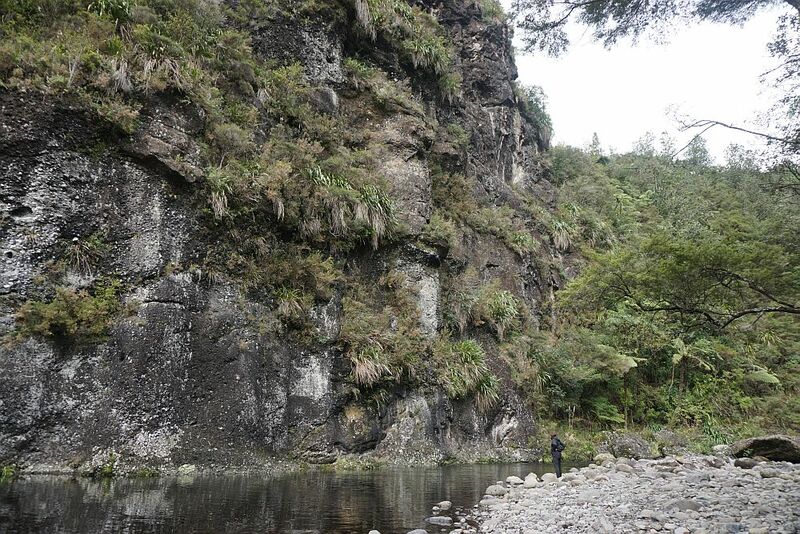 Here also a good view of Maungawhio. A few remains of the tramway can still be found, including some lengths of rail. Some of the sleepers are also still in place, complete with spikes to hold the rails. Maungawhio can be seen through the mist. Short showers came and went during the walk. 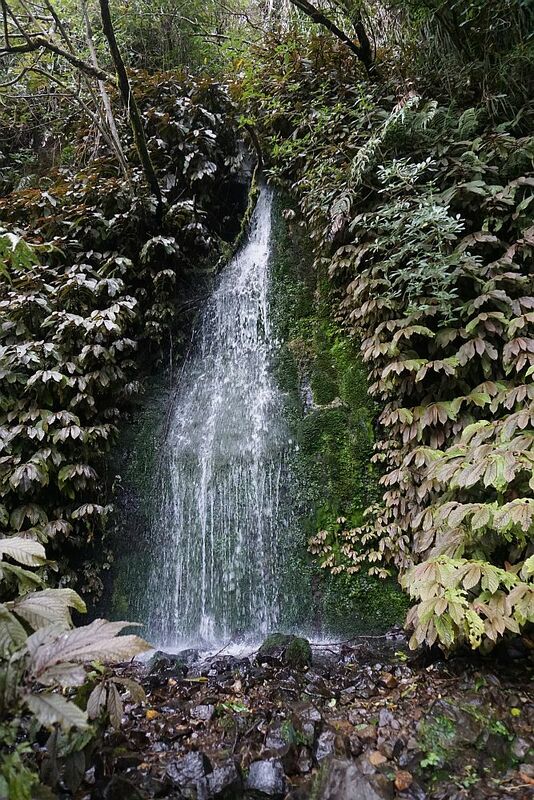 A small waterfall alongside the tramway. Daly’s Clearing Track joins up with the tramway. 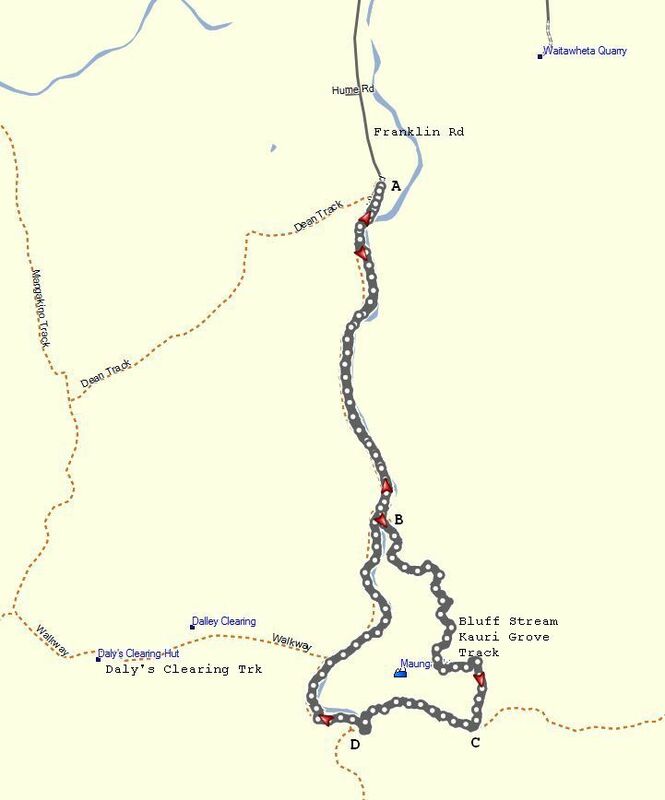 It’s possible to return to Franklin Rd via this track and Dean (or Deam) Track, adding about 4km and almost 2 hours compared to the direct route via the tramway. Dean (or Deam) Track joins with the tramway near the end of Franklin Rd. 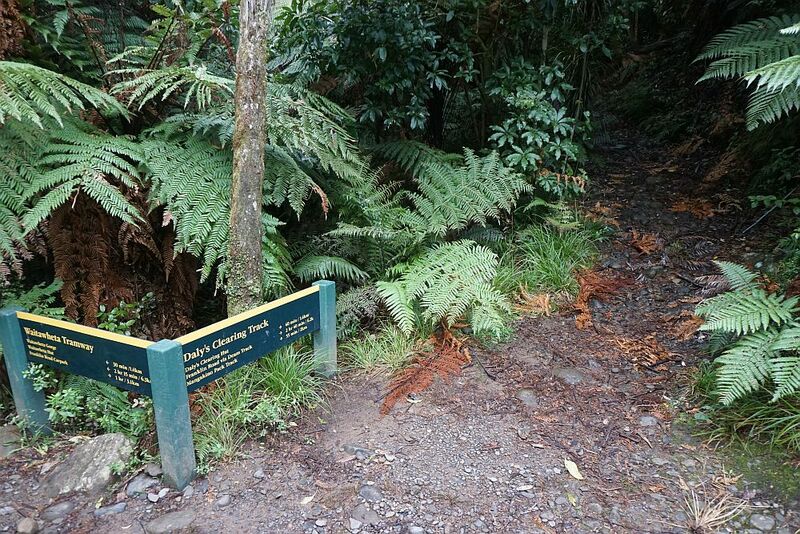 It is marked as Mangakino Valley on a DoC sign across the road from the steps. The GPS track log shows the total walk of about 9.5km, with a total time of about 3 hours 40 minutes. Lowest elevation was about 145m on the walk through farmland, and the highest elevation about 300m along the Bluff Stream Kauri Grove Track (B to C on the track log). A to B (through farmland): 2 km , 30 minutes. 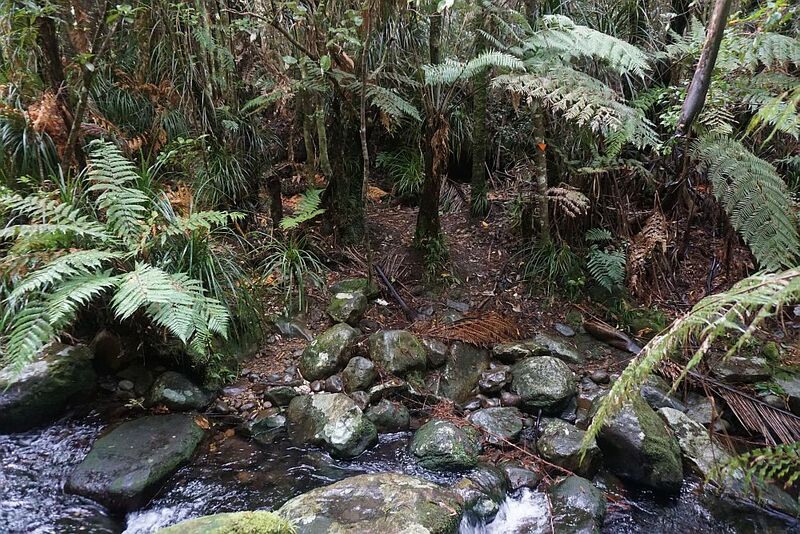 B to C (Kauri Grove Track): 2.3 km, 1h 10m. 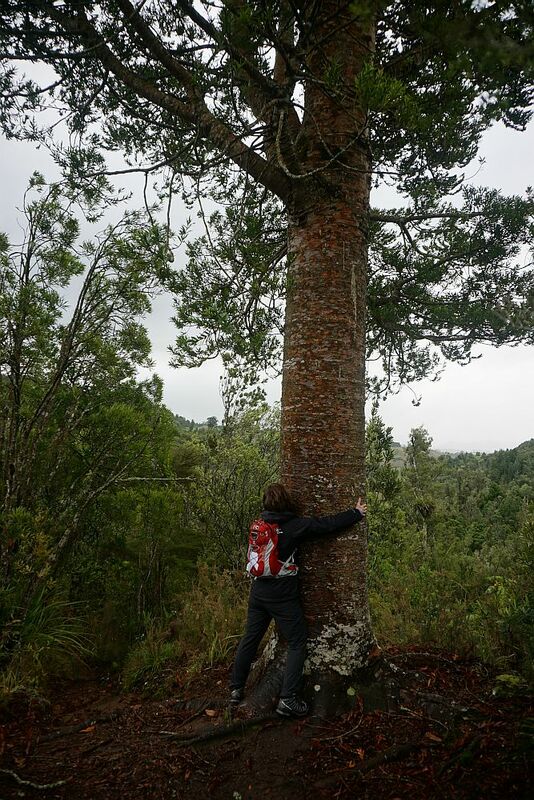 C to D (large Kauri): 1.2 km, 40 minutes. D to B (tramway): 1.9 km, 40 minutes. B to A (farmland): 2 km, 30 minutes. The track was walked on June 14, 2015. 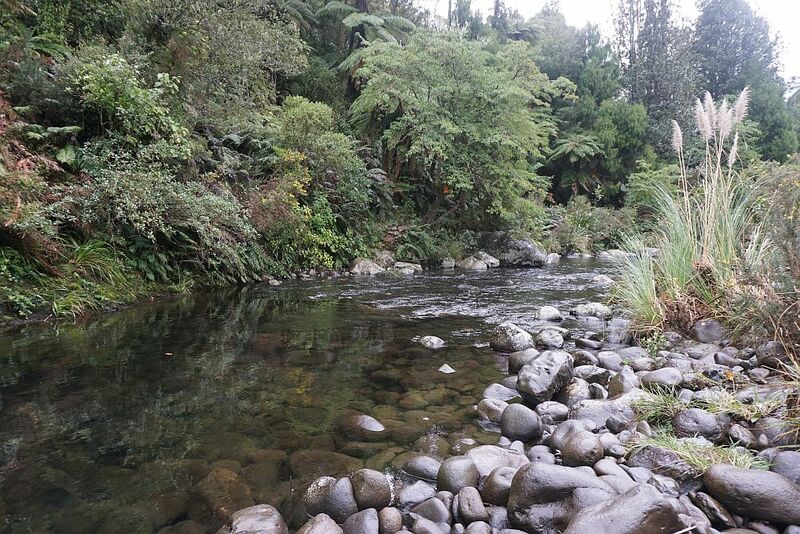 This entry was posted in Walks and tagged Bluff Stream, Kaimai Mamaku Forest Park, Karangahake, Kauri, Maungawhio, Waihi, Waitawheta on 2015-06-15 by nzartig.